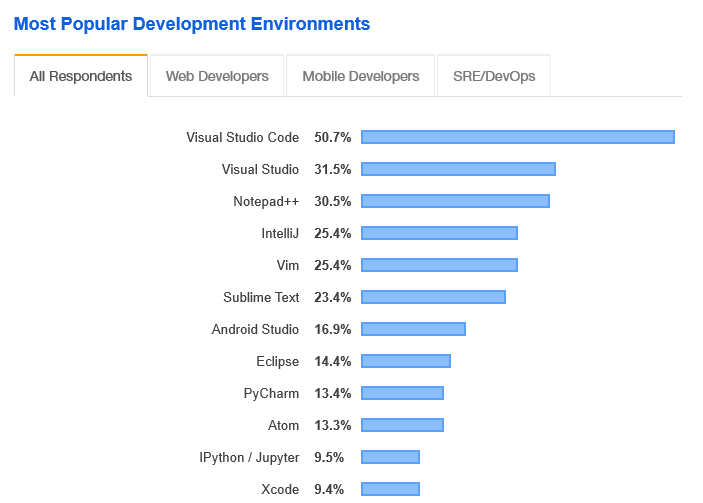 Stack Overflow has released the results of its annual developer survey. I took a quick look, comparing the figures to those for 2018. The survey is based on results from 88,883 developers from 179 countries. 400 responses were excluded because they took less than 3 minutes to complete! 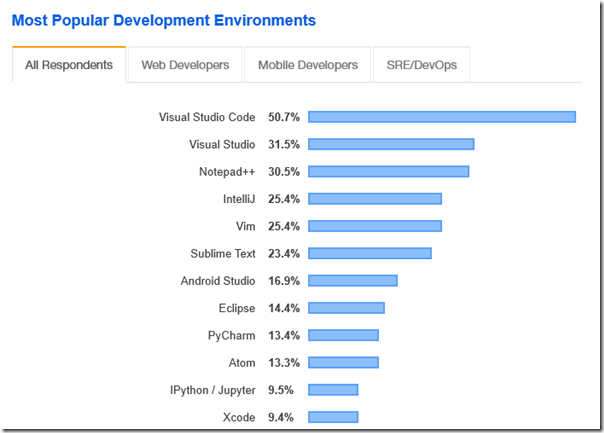 Visual Studio Code is the most popular development tool, with over 50% of developers saying they use it. This is up from 34.9% last year. Visual Studio (which I guess includes Visual Studio for Mac) is second but has gone down from 34.3% to 31.5%. Visual Studio Code is an amazing success; it is only four years old. What is the benefit to Microsoft though? There must be some benefit via the branding and gentle steers towards Microsoft services such as Azure; but this is mainly about Microsoft delivering a great free and open source developer tool and getting kudos in return. TypeScript is up from 17.4% to 21.2%. Another impressive open source project from Microsoft and the great Anders Hejlsberg (Object Pascal, Delphi, C#, TypeScript). In frameworks, last year StackOverflow had a single category for .NET Core (27.2%) while ignoring .NET Framework. This year it has 23.7% for .NET Core and 37.4% for .NET – no trends are therefore visible but next year perhaps. There is an overly broad platform category including everything from Raspberry Pi to WordPress to AWS. I do not have much confidence in these figures, but notice that AWS is up from 24.1% to 29.5%, Google Cloud Platform up from 8% to 12.8%, and Azure up from 11% to 11.9%. Not good figures for Azure, now third behind AWS and Google. But Microsoft can take comfort from Windows, supposedly up from 35.4% to 50.7%. Both Android (29% to 27%) and iOS (15.5% to 13%) are down slightly. I do not think this is meaningful movement but it does suggest that mobile app development is not longer a big growth area; perhaps there is more attention being paid to server apps. Previous PostHands on with Windows Virtual DesktopNext PostMicrosoft Planner: a good task management solution for small teams?